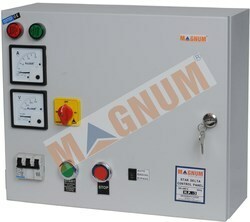 MAGNUM Three Phase STAR-DELTA CONTROL PANEL is a powerful switching & controlling device for motors wherein primary requirement is to start the motor at reduced voltage in comparison to DOL method of starting. Thereby reducing disturbances on the electrical supply. It incorporates protection against single phasing, phase reversal and provides auto-restart facility. · Seven tank treated MS powder coated enclosure to provide better corrosion resistance. · Three Air-break contactors with precisely calibrated bimetal contact tips. · Short circuit protection through MCB. · Flexibility to incorporate set of varied type of contactors for example MaCH/MaK-1/MaU. · Single phasing & phase reversal protection incorporated through preventer with auto unit. · Automatic restart on resumption of power through preventer with auto unit. · Inbuilt precise star-delta timer. · Reliable Over-voltage protection via MaK-1/MaCH/MaU relay. · Manual reset facility after overload protection. · Machine wound & vacuum impregnated coils offering wide voltage band. · Ergonomic design with aesthetic looks. · No screw protruding from the Panel back. Hence additional safety from water, dust, corrosion and electric shock.